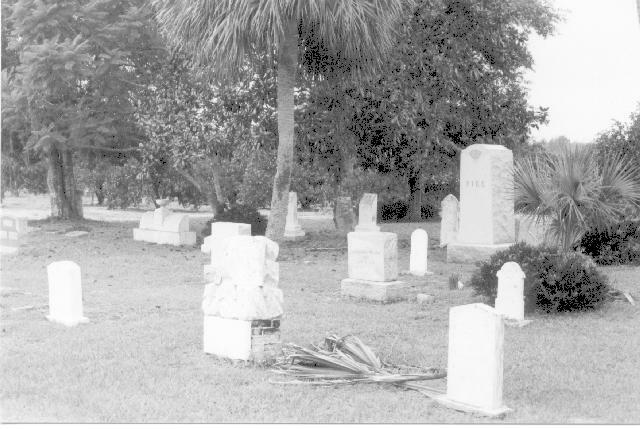 The cemetery is located in the city of Umatilla west of State Road 19 and south of County Road 450. The cemetery is on Golden Gem Road which runs through the cemetery splitting it into east and west sections.. 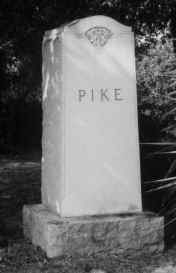 The PIKE plot is located at the southwest corner of the west section of the cemetery. The map coordinates for the cemetery are 28-55-32-N and 081-50-51-W. This is now a city cemetery operated by the City of Umatilla. This cemetery was originally operated by an association which went defunct and the city took it over. There are no records available showing the original purchasers of the older plots and the people buried there. The remaining records are available at the city hall. The older records consist mainly of payment receipts going back to the 1950's. I was at the cemetery for the burial of my grandmother (Bessie Thomas) in 1968. I visited the cemetery in November 1981 and again in November 2000. There had been no new burials in the PIKE section since 1968. The only change was damage to the # 7 headstone which had been broken off at the base sometime between 1981 and 2000. In November 2000, the top portion of the headstone was missing and only the base remained. There is a 1981 photograph of the headstone below. The below diagram shows the location of graves in the section. There do not appear to be burials in the unmarked areas with the possible exception of the area between numbers 6 and 7. Click on the links to view photographs. These photographs were all taken in November 1981. Mardie is the daughter of J. M. and Louee Thomas. 1981 photo. This headstone was broken and missing in November 2000. Only the base remains. Joseph H. Hinson married Jane Pike on 24 Feb 1878 in Orange County, Florida. Jane Pike is the daughter of S. H. Pike and Martha Pike. Daughter of S. H. and Martha Pike. Piety Pike married A.H. Jameson (Alexander Holmes Jameson) 14 June 1884 in Orange County, Florida.